More Fruit is an exploratory product design by Belgian designer, Ruben Deriemaeker. 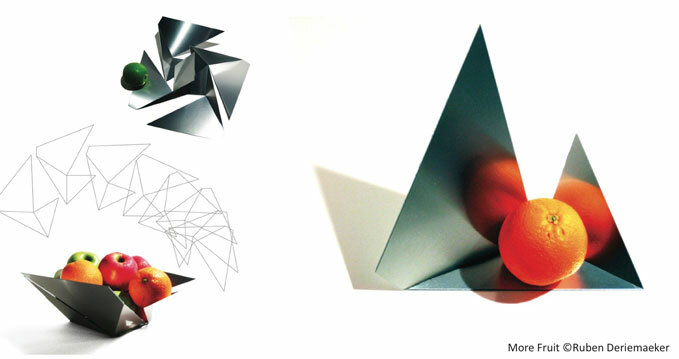 The project utilizes Dibond aluminum composite waste material that is cut, milled and folded to produce a fruit bowl. Interestingly, the fruit bowl only fits together when fruit is in the bowl, without it, it collapses. a. Hand operated routers equipped with modified 90-105 degree “V” bits (See figure 1) can be used effectively to remove material for folding. b. Table or circular saws can be equipped with a special blade (See figure 2); these blades referred to as “V” routing blades produce very close tolerances at a much faster rate than hand routers. a. A very small radius can be achieved by “V” routing and folding. The depth of the “V” rout is critical. As a general guideline, the exterior aluminum skin should be visible through the polyethylene core at the valley of the rout; this visual appearance should be consistent along the entire length of the rout (See figure 3). Constant depth of the rout ensures a good smooth line when the fold is made. Extreme care should be taken not to score the exterior aluminum skin with the cutter. b. By changing the shape of the cutter used, a larger radius can be achieved. A flatter, wider cut will result in a smoother bend (See figure 4). a. An aluminum composite panel requires a “grooving” operation along any fold line prior to bending. This operation can be done with a custom saw blade or a customized router bit. Regardless of the tooling used, the groove is commonly called a “rout.” The most common rout is a modified “90° V” with a flattened (1/8″ wide minimum) bottom. The reason for this modification is so that the aluminum skin does not overstress during the bending process. Once correctly done, this V-Rout allows the composite panel to be folded along the rout from 0° to 90° easily. b. A rout made with profiles other than 90° allows the substrate to be bent to various angles. These profiles eliminate fabrication problems and combine to create different joining techniques. 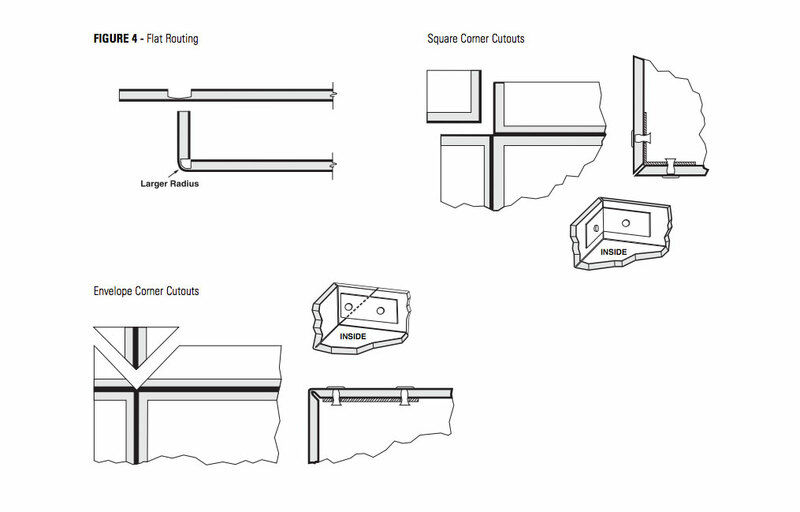 Two additional common router profiles discussed in this document are the 135° and the Flat Rout. a. The most common corner is a 90° Rout and Return. This corner is made by folding a V-Routed panel to a 90° angle. b. It is critical that the modified V-Rout is made to the correct depth to create a good return angle. “Spring back” will occur if the rout is not deep enough, however, extreme care should be taken not to score the exterior aluminum skin with the router bit or blade during the routing operation so that the aluminum skin is not weakened. The depth is correct when the exterior skin is intact with approximately 1/64″ of polyethylene in the bottom of the V-Rout and the return does not “spring back” when folded.